One of the most attractive features of the Civilization strategy games has been the large number of civilizations you can choose to play as, including historical ones like Egypt’s Cleopatra, and more modern nations like Brazil. 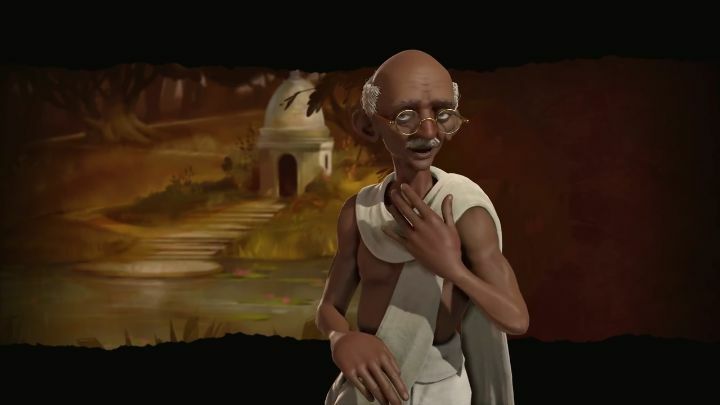 So many Civilization fans will likely be pleased to hear that Gandhi in Civilization VI will be more like his real-life self, and that playing as India in the game will encourage a more peaceful playstyle. This is due to the way in which India can take advantage of religion in the game, as the Indian civilization gains bonuses after meeting other civilizations which have already founded a religion, plus India also gets all the “founders beliefs” from all religions present in their cities, not just their own (like the Protestantism founders belief which provides extra food from temples and shrines built in cities, for instance). Also, other cities in the game will likely think twice before declaring war on India, as they will receive a happiness penalty making their people more unruly, meaning that conducting war against the Indian civ will be a harder task in this latest Civilization instalment. But if the inevitable occurs and India gets entangled in a military conflict players will have their Varu military units at their disposal, a fearsome war elephant that has the special ability of making enemy units on adjacent squares less effective in combat. All in all, it looks like India will be as much fun to play as the other Asian civilizations which will also feature in the game (like Japan and China), and especially attractive for those players looking to win through religion without firing a shot in Civilization VI, a game which is shaping up to be another good entry in the long-running Civilization series when it ships later this year. Will Nintendo’s mobile approach with the NX work in today’s console market?